Two pianos, four hands, one heart. 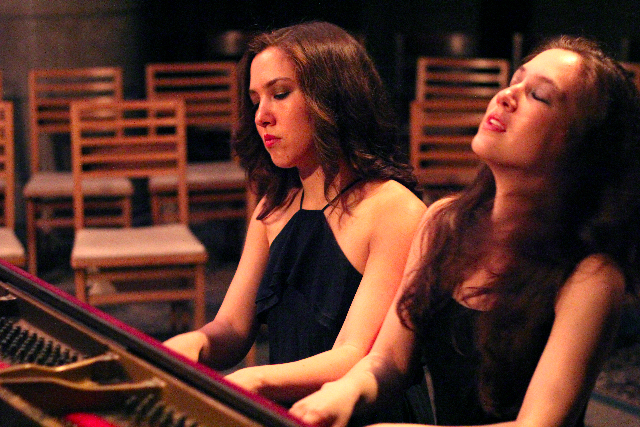 The twin duo-pianists Christina and Michelle Naughton performed Visions de l'Amen at a Crypt concert. 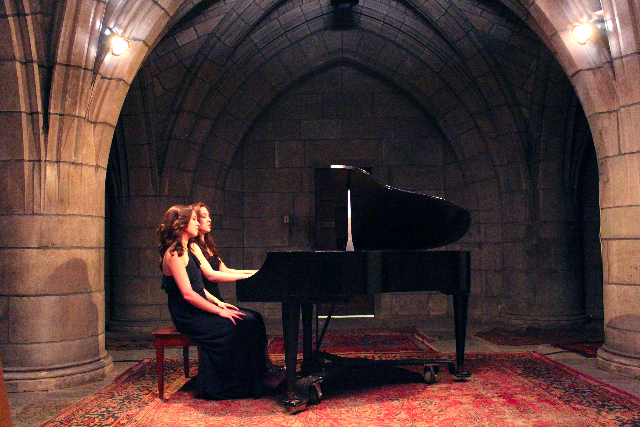 Two pianos, four hands, one heart. The setting is beautiful, with arches catching the eye at each turn. Oriental carpets cover the cold floor to warm the sound. Yet is remains bright for the carillion-like tones. Yamaha donates pianos. 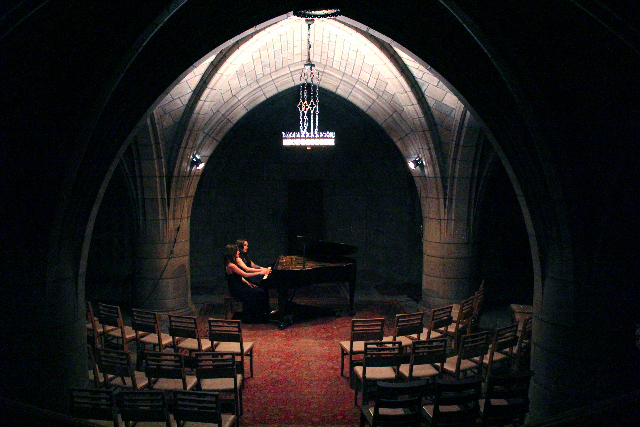 These popular Crypt concerts, conceived by the gifted impresario Andrew Ousley of Unison Media, are sold out. There is a reason why. The performances are intimate and of the highest artistic caliber. Tonight is no exception. The Naughtons performance is a blinding bedazzlement. Composer Olivier Messiaen, who premiered his Visions de l’Amen, performing himself with his wife Yvonne Loriod, would enjoy the kind of union suggested by a twin gene pool reaching for the heavens. 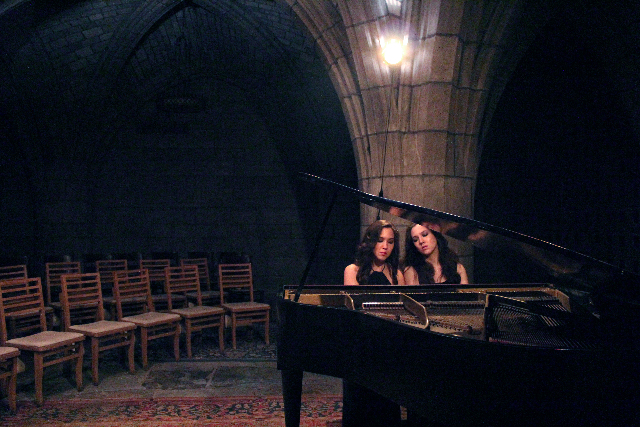 In the Crypt, the twins are separated by the open sounding boards of two Yamaha grands. You can watch them eye each other, taking turns. They also occasionally lock eyeballs and smile in the delight of their collaboration. A spiritual beauty lurks in the origins of the music. Certainly the Naughtons seem bound to one another, although there are sparks of difference. This does not suggest conflict, but rather an opportunity to work to achieve unity, as Messiaen must have worked to embrace his God in the face of the Nazi occupation of France. This composition was begun during 1942 and premiered in 1943. The Naughtons bring out the essence of each Amen. The two rhythmic characters of Creation, static and dynamic, are contrasted. If second piano plays the carillion's melody with the regularity of a time clock, the first is free, offering seemingly improvised syncopations which lead to unknown territory. The Amen of the Stars and Planets can seem still. Desire echoes both Iseult and Susanna from Marriage of Figaro. The Naughtons are masters of Messiaen's intrigues. Is it possible the feelings of one twin influence the feelings and actions of the other in a way the composer intended? This is beyond our understanding. Actor and acted upon is flipped and re-flipped. Messiaen drew such notions from the theatre. Full-bodied bass sonority underpins carillon-like sounds at the top. Points are often made by articulation and accent rather than speed, although as the piece progresses there are extraordinary rushes of notes by both pianists. A driving bass line is sometimes cut by slashing chords. As an encore the Naughtons played an adaptation of a Bach chorale. Sitting next to each other on one bench they performed as one, their left and right arms touching. All the two-ness has disappeared. They sit very straight. The tones are magisterial yet warm. They offer a comforting resolution of spiritual struggle. How many more dimensions of duo pianism will they display? One eagerly awaits their next concert.